We couldn’t resist another Hunter book. In honor of his memorial in August we felt it was the perfect time to take the savage journey into the heart of the American dream. We hope you will join us for the discussion beginning Tuesday, September 6. The discussion will begin in early November. 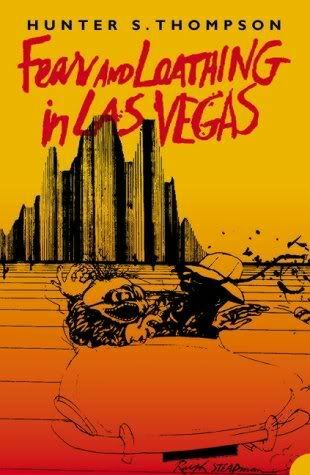 August 2 ~ September 5 ~ Read Fear and Loathing In Las Vegas - Tidbits! October 3 ~ October 31 Read A Long Way Down ~ Tidbits! I almost bought the Hornby book! I bought The Historian instead. It looked so fascinating, looking for Vlad the Impaler! I already have so much on my shelf.... but A Long Way Down will be out in trade paperback by November, I hope. Can't wait for the FALILV discussion! Great line up DITHOT and Liz! Looking forward to some great tidbits and discussions! I have to go buy I, Fatty (quickly, quickly!) and then FALILV, but I already have A Long Way Down (and I am very excited to read it). Excited for the upcoming discussions! Marla's philosophy was that she could die at any moment. The tragedy was, she said, that she didn't. I bought A Long Way Down yesterday. I hope to read it during the summer. I've only heard good reviews of it. Dirt...this is a jar of dirt. Great to get the new calendar, thank you! I'm hoping to be able to catch up and join in, I tried earlier this year, but I'm so involved in reading about John Wilmot, I just couldn't fit any more books in. I do have Shantaram and I, Fatty though and will endeavour to go on as many literary journeys as I can! We have a different cover for the Nick Hornby book here in England, I'm wondering if it will be out in paperback soon as over here hardbacks are quite expensive. 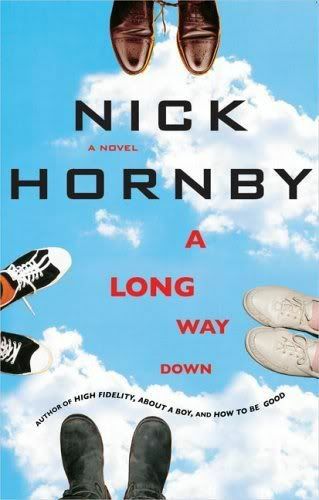 Jackslady wrote: We have a different cover for the Nick Hornby book here in England, I'm wondering if it will be out in paperback soon as over here hardbacks are quite expensive. Is it the red and black cover? I don't know how long it usually takes for a book to come out in paperback, anyone else? The discussion won't be until November so maybe by then it will be out. It takes anywhere from 6 months to a year for a novel to come out in paperback. I didn't have the money to buy Shantaram when it was being discussed here and I was quizzing my sister (four years at an airport bookstore will give you some knowledge) about hardcover to softcover. deeplyinlovewithdepp wrote: It takes anywhere from 6 months to a year for a novel to come out in paperback. I didn't have the money to buy Shantaram when it was being discussed here and I was quizzing my sister (four years at an airport bookstore will give you some knowledge) about hardcover to softcover. Thanks for the quick answer. I wonder if it depends on the sales while it is in hardback? If it is selling well I would imagine it would take longer to come out in paperback, assuming they make more money off the hardback sales. I would imagine sales has a lot to do with it, but sometimes hardback and softback dates are set in advance so that those eager to purchase will know when they are being released. I imagine A Long Way Down will sell quite a few copies. I'll try and stick with the older books. Buying hardcovers is just too rich for my blood. Yes, the UK version is the one with the red and black striped hard cover, I looked at it in Borders today! Over here (England), it's retailing at £17.99 which is quite expensive. In my experience in this country it generally takes around a year for a book to make it to paperback, however I can always try and get it from the library or scour discount bookstores. I want to try and get it a bit in advance because I'm not the fastest reader in the world. Jackslady wrote: Yes, the UK version is the one with the red and black striped hard cover, I looked at it in Borders today! Over here (England), it's retailing at £17.99 which is quite expensive. In my experience in this country it generally takes around a year for a book to make it to paperback, however I can always try and get it from the library or scour discount bookstores. I want to try and get it a bit in advance because I'm not the fastest reader in the world. I've already read it, not sure if I will be able to remember it by November. I got it from the Library where I had reserved it along with a vast amount of other people he is very, very popular.